Join us for a jazz warm-up, and more specifically to a meeting organised as part of the “Extra Time” series, during which jazz pianist Kuba Stankiewicz will share his inspirations — not only those pertaining to music only once — and you can listen and watch it only at Barbara. The meeting will take place on the 24th of April at 6:00 p.m. at Barbara. (Świdnicka 8b) Admission to the event is free. Kuba Stankiewicz has been one of the leading Polish jazz pianists for many years. In the second half of the 1980s, he played with the band of Jan Ptaszyn Wróblewski, and later on with Zbigniew Namysłowski’s quintet and quartet (with whom he recorded Open and Song Of Innocence albums). 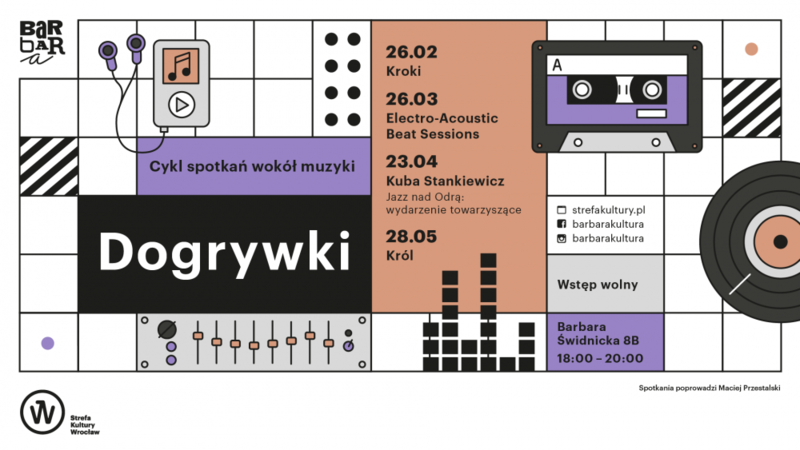 During the Jazz on the Odra Festival, on the 30th of April, he is going to present his musical project reminding us of the work of Polish composer Roman Statkowski. What do musicians listen to while cleaning the house? And when they have had enough of everything? What song changed their lives and what they would never admit to listening to? The starting point for conversations with artists will be the selection of songs, but also videos and photos, which they will choose themselves for this one meeting, to be seen together – only once, only at Barbara. Apart from questions asked by Maciek Przestalski (Radio Wrocław Kultura and Radio RAM journalist), the meetings also feature a Q&A session with the audience. Admission free. The number of participants is limited.